When I was a kid, St. Patrick's Day meant you wore a green shirt to school. That's it, end of story, Happy St. Patrick's Day, done deal. Sure, there were stories of leprechauns, four leaf clovers, rainbows, shamrocks and pots of gold. Also, fine. Holidays today have gotten totally out of control... I mean, think back to last month. When did Valentine's Day become Halloween II? Multiple store aisles worth of chocolates and gifts... am I really supposed to pass out pink and red fun-size Milky Way and Snickers bars? Good Lord. 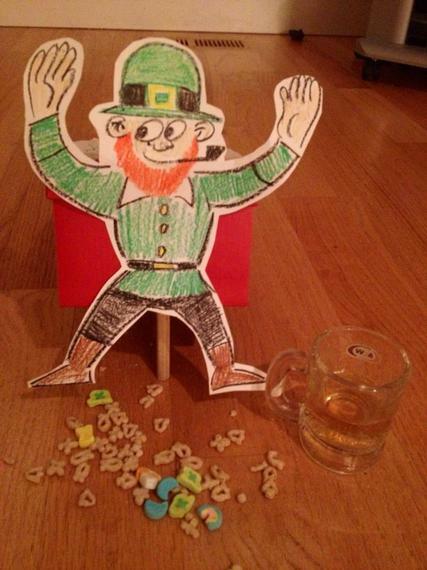 Yep, it's a damn leprechaun trap. Who did this as a kid? Not me, not ever! Never heard of it. But somehow, I got it in my head that we needed to set a trap to catch one of these things and now all of the sudden I'm Irish (I'm Italian). A giant mug of beer for yourself so you can quietly contemplate why you are running out to Safeway in your pajamas on a Sunday night to buy Lucky Charms for a friggin' leprechaun trap. And I don't want to spoil the surprise or blow the ending for you guys, but you're not going to catch anything in that trap, except maybe the ants who get lucky by carrying off the hearts, clovers and rainbow marshmallows you've willingly scattered all over your living room floor. Once the kids are asleep and you've downed your third pint, it's time for the MAGIC to happen. And by magic I mean you pull the ruler out and leave behind some of your hard-earned cash for your children. Coins. Or chocolate coins. And maybe some (ugh) glitter. Because the leprechaun wants to say "thank you" for trying to "trap" him by leaving your kids a gift of chocolate, or money. Seriously... who came up with this? Oh yeah... I'm pretty sure I did. If Valentine's Day is now Halloween II, St. Patrick's Day is now a mix of Easter/Breakfast/The Tooth Fairy because of chocolate, cereal and glittery money. In the end of course I love it... because they love it. I also love finishing off an open bottle of beer that's been left by my children for a mythical fairy -- Happy St. Patrick's Day.